In 2013, the production and sale of cannabis became fully legal in Uruguay. With this in mind, you’ll see a lot more than alcohol ads in this country. In fact, there are now posters that encourage the public to drive safely after consuming the herb. Cannabis became legal in Uruguay in 2013. 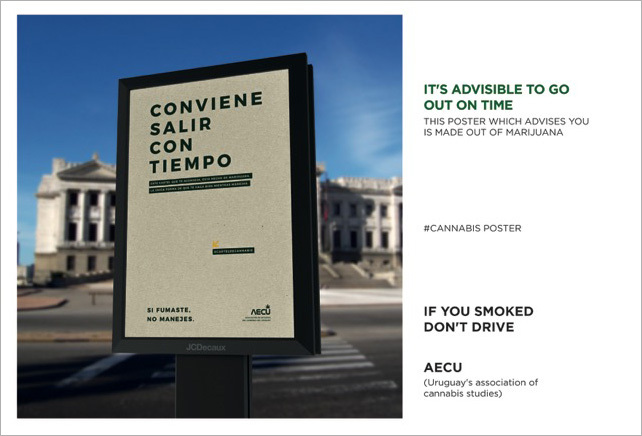 Now, specifically for the Uruguay’s Association of Cannabis Studies, the country has three signs that advise no smoking and driving. The are made of hemp, so the country calls them “potsters” – a pun that any cannabis enthusiast can appreciate. The signs made their way to the busy streets of Montevideo after Christmas and will remain in place for another couple of weeks. We reasoned that if posters made out of pot gave you advice about safer driving, it was probably the most ideal way in which marijuana can actually be beneficial to someone while behind the wheel. After shredding, flattening and drying the hemp, the sheets are hand-crafted with great care and thoroughness. Ciapessoni uses a silk-screening process to apply the text. The main objective of all of this is to make people understand how important is to be very responsible when driving. It is equally important for us to send a big message so that it will have meaningful social impact. It would be really funny, but not effective, because the process for producing the paper removed the psychoactive effect. So if someone smoked it, it would be like smoking a standard paper.